You're 3 steps closer to clear skin with Neutrogena, Life Brand and NeoStrata! Rapid Clear Stubborn Acne Cleanser - 125ml - a refreshing facial cleanser that lathers into a rich, creamy foam that quickly dissolves pore clogging dirt, makeup and oil without over drying for skin that feels clean and fresh and appears shine-free for hours. 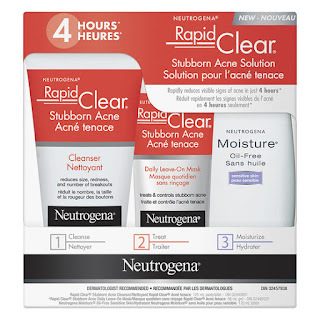 Rapid Clear Stubborn Acne Daily Leave-On Mask - 56ml - with a gel formula that vanishes instantly into skin, allowing acne medicine to absorb deep down, killing acne-causing bacteria and keeps working all day to fight both current breakouts and the acne forming under the surface of the skin. When used daily, it helps keep breakouts away to control stubborn acne, all without over-drying skin. Unlike traditional masks, this is not a wash off - instead, it stays on the skin, allowing the acne medicine to work hard hour after hour. It also dries clear so it can be used under moisturizer or makeup. Moisture Oil-Free Sensitive Skin Lotion - 120ml - a lightweight, water-based, alcohol-free moisturizer that vanishes into skin providing gentle yet effective moisturization for even the most sensitive skin without leaving it greasy or shiny. Life Brand Clear Action Active Anti-Acne Treatment Kit - $19.99 - a 3-step acne system that targets the root causes of acne: oil production, bacteria and dead skin cell build-up. Step 1: Renewal Cleanser - 118ml - gently removes dirt, oil and dead skin cells, while preventing and killing acne bacteria to leave skin without over-drying it. Step 2: Revitalizing Toner - 118ml - cleans, conditions, and rejuvenates skin with an alcohol-free formula containing witch hazel, aloe vera and chamomile to restore skin's natural balance. Step 3: Repairing Treatment - 59ml - with benzoyl peroxide that fights acne and penetrates pores to control acne pimples - treating active breakouts and preventing future ones. NeoStrata Acne Clear Clarifying Gel Cleanser - 200ml - $24.50 - with 2% salicylic acid, it deep cleanses and penetrates pores to wash away bacteria, oil and impurities, unclog pores, exfoliate dead skin cells, dry and help clear up acne pimples, while soothing skin. NeoStrata Acne Clear Clarifying Solution - 200ml - $29.50 - highly concentrated in glycolic acid and salicylic acid to unclog pores, dry and help clear up acne pimples to leave skin even more exfoliated and clear. NeoStrata Glycolic Renewal 10% Smoothing Lotion - 50ml - $42 - the perfect daily oil-free moisturizing lotion for combination to oily skin that features 10% glycolic acid to hydrate and exfoliate the dead cells on skin’s surface while maximizing skin renewal - to help reveal a smoother, even, more radiant and visibly younger looking skin. Avon Sun + Sunscreen Face Lotion SPF 40 - 88ml - $9.99 - a lightweight lotion with an oil-free formula that absorbs quickly and is water-resistant for 80 minutes.